The product range of “Industry 4.0” promises to grow further this year. In 2018, sales in the German market are expected to amount to more than seven million euros and thus exceed those of 2017 by more than 22 percent. The range of products is huge. To name but a few, we already have the so-called Internet of Things, self-driving cars, electronic patient records and networked production facilities. In Saxony-Anhalt, a federal state in the heart of Germany with an impressive economic history, the so-called fourth industrial revolution has long since started and is spawning remarkable new products. It is only logical that the history of the industrial revolution continues to be written in Saxony-Anhalt: the very cradle of German engineering, the birthplace of Otto von Guericke’s vacuum technology, and the place where the Association of German Engineers (VDI) was founded. To promote future-oriented innovations, the Saxony-Anhalt Ministry of Economic Affairs has been awarding the Hugo Junkers Award for Research and Innovation for more than 25 years. And many of the developments in recent years, true to the trend, have been introduced with “4.0” as their pitch point. Third prize in the category of “Most innovative product development” in 2017 went to SONOTECH Ultraschallsensorik Halle GmbH from Halle (Saale) for its “SONAPHONE Digital Ultrasonic Testing Device for Maintenance 4.0”. Its name may be complicated, but its operation is very simple. The mobile device is no larger than a smartphone and is operated by a touchscreen. The digital ultrasonic testing device is used at every stage along the entire testing process – from planning and measuring to analysis and repair. It identifies leaks in windows, doors, vehicles and components. It analyses the condition of machines and plants and determines the optimal maintenance time. And, by assessing the function of steam traps and valves, it helps to avoid water and energy losses and thus damage to plant and machinery. Although “Industry 4.0” is a German neologism, it is catching on fast in other countries. This is hardly a surprise, given Germany’s position in the global economy. Even the Saxon-Anhaltian company citim GmbH, a company in the Oerlikon Group, saw its renown extend beyond German borders in 2017. The company has mastered the relatively new technology of “additive manufacturing” like scarcely any other. Founded in 1996 as a spin-off of Otto von Guericke University, Magdeburg, citim is now a world leading supplier of additive manufactured metal parts. You may know of additive manufacturing by its other name: 3D printing. 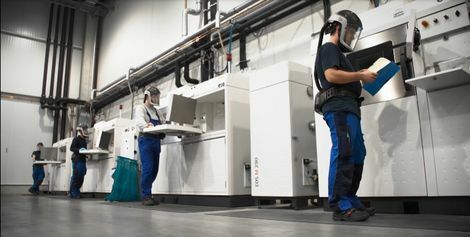 One production site in Barleben is a pillar of the Oerlikon AM service concept, which combines all the elements of additive manufacturing, starting from metal powder and continuing on to design, manufacture, finishing and quality control. An impressive example of the company’s competence is the antenna arm it manufactured for a satellite of the European Space Agency (ESA). Thanks to optimisation by 3D printing, they managed to reduce the weight of the component to nearly half the original – for close to the same strength. “We work for highly innovative companies. Our customers come mostly from those industries that develop new products and have the courage to employ new manufacturing technologies,” says Andreas Berkau, Head of AM Service Europe. “Predictive maintenance”, is one of the big buzzwords of Industry 4.0. A young IT company from Saxony-Anhalt is a pioneer in this field: Indalyz Monitoring & Prognostics (IM&P) GmbH from Halle has developed software-based predictive maintenance strategies for individual machines, complex systems and machine clusters. Its prognosis software is based on self-learning, artificially intelligent core algorithms that are in turn combined with various filters and predictive methods. The first application in which the young company put its product to the test was wind energy. IM&P analysed the data of 650 wind turbines in a three-year observation and prognosis of the turbines’ technological condition. According to IM&P, nearly 95 percent of the predicted wear reports proved accurate in practice.